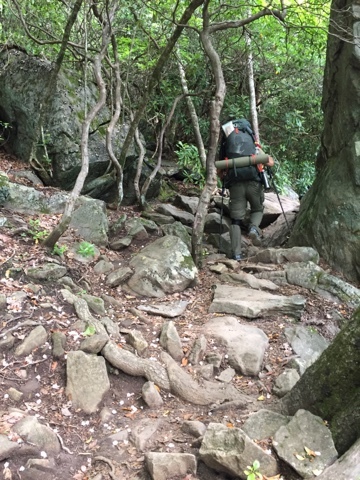 I'm finally getting around to posting our last section hike on the AT. This trip was a little different because it was just the Mister and me. But I have to say, we enjoyed it so much! 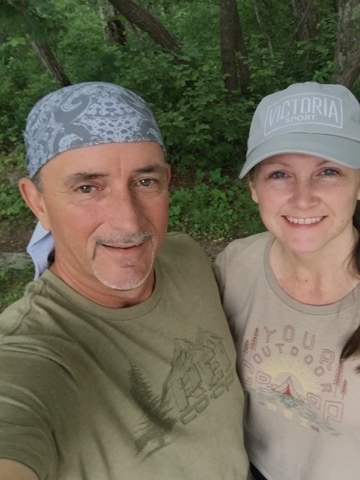 We picked up where we left off last year....at Woody Gap. Our final destination this time? 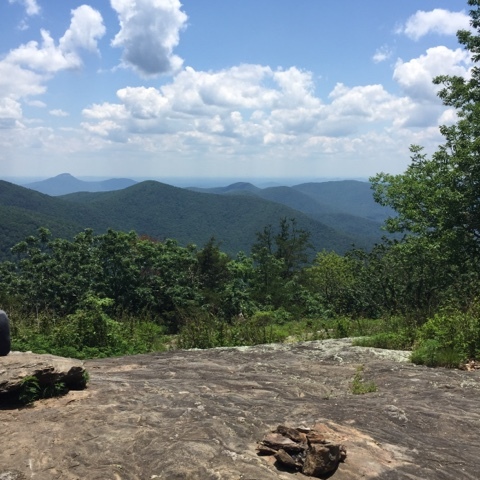 Hog Pen Gap....about a 20 mile hike. This trip provided more scenic overviews than the one before. And of course, we always stop for a quick break to appreciate the beauty all around us. 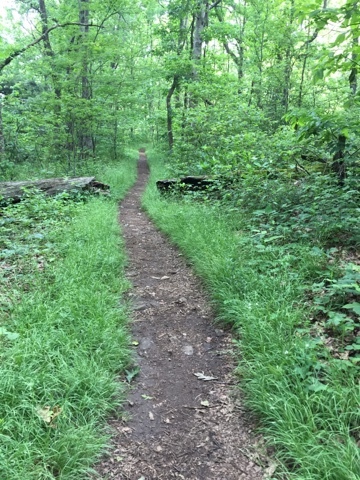 Any time the trail takes on a well defined path, a certain scripture comes to my mind. "Thy Word is a lamp unto my feet and a light unto my path" - Psalm 119:105. I always have a hard time trying to pick out pictures for these posts because I take so many. 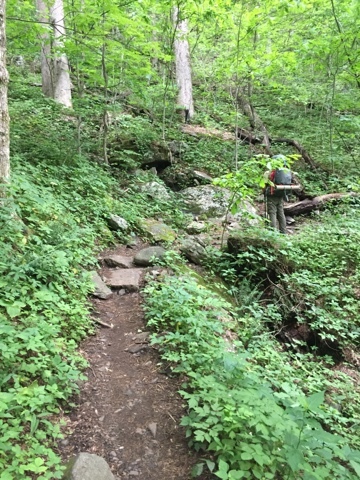 But I want you to get a feel for the types of things we see on each part of the trail. 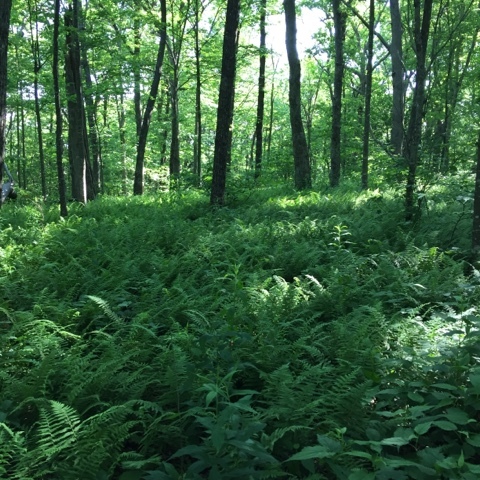 Of course, pictures don't do it justice (and I also just use my Iphone...I don't want to worry about my nice camera while hiking). 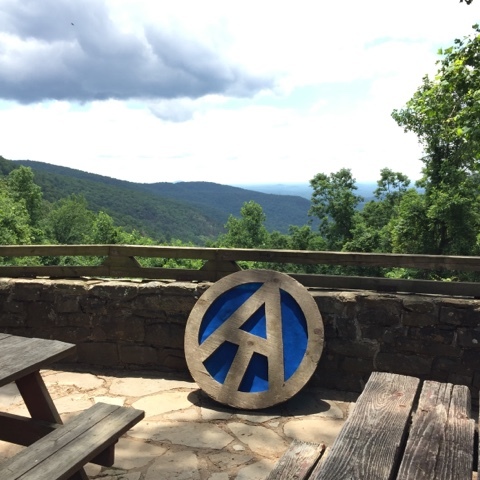 If you know anything about the AT and backpacking, you know that you have to filter your drinking water. 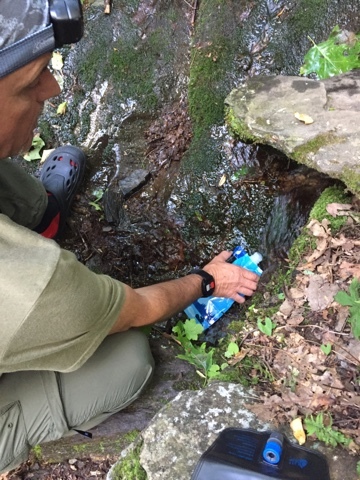 We pack extra water, but when you're going to be on the trail for several days, filtering water is a must. It's a very easy process, though. 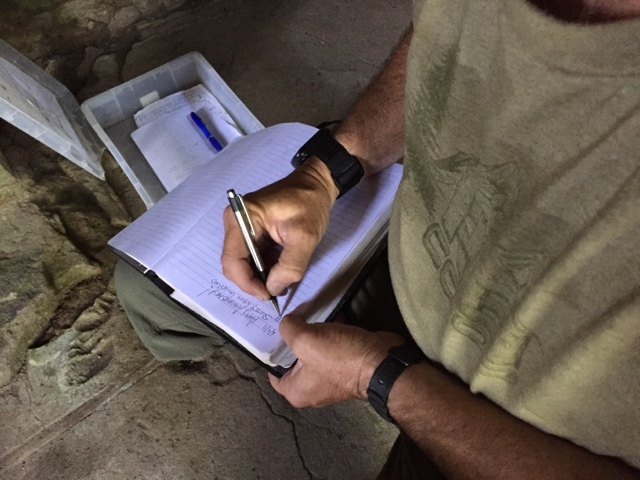 You just have to do your research to know where the water sources will be. 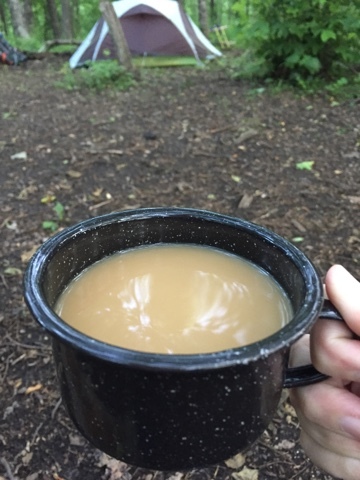 This may be roughing it, but I'm always able to enjoy a good cup of coffee. I bring my black enamel ware mug with a bag of sugar cubes, Folgers coffee singles, and my favorite travel creamer, Nestle Hazelnut . It really is delicious! And what's better than a cup of coffee in the morning in the beautiful mountains? 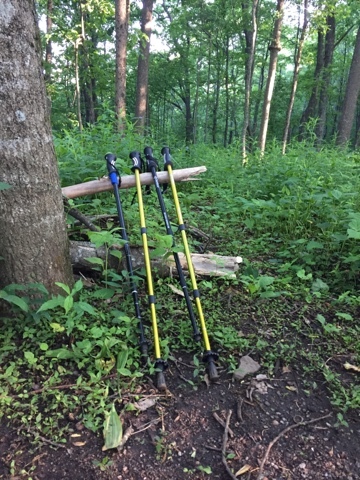 On our first hike, we only carried one hiking pole each. Now we carry two and it really does make a big difference. 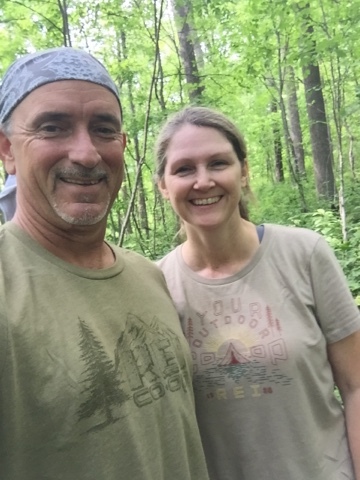 These are the Ozark Trail brand we purchased from Walmart when we first started hiking. They're really good poles for starting out, but the Mister now has a set of Black Diamond poles he recently purchased at REI. They are almost weightless compared to the others and he highly recommends them. 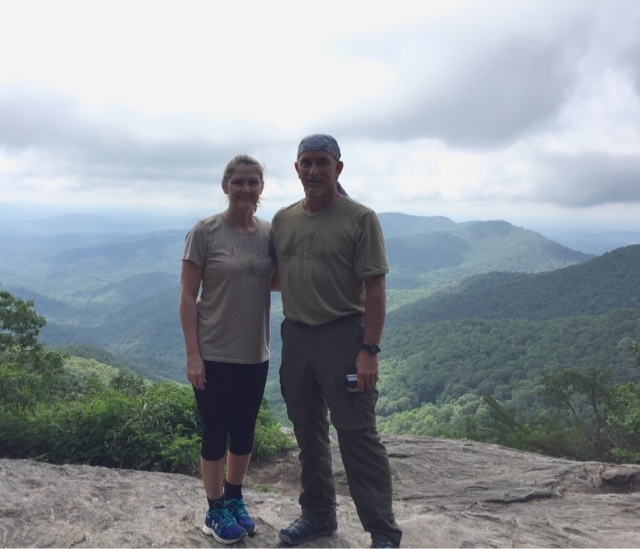 The biggest challenge of this section of the hike was hiking Blood Mountain. 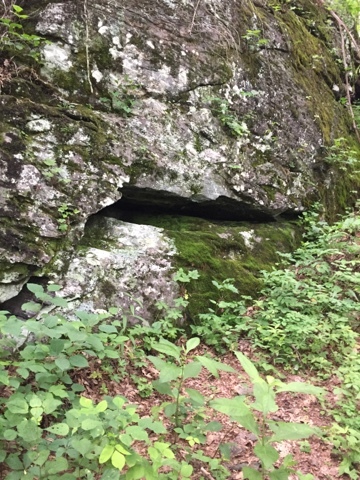 The photo below was taken at Slaughter Creek, basically the base of Blood Mountain. 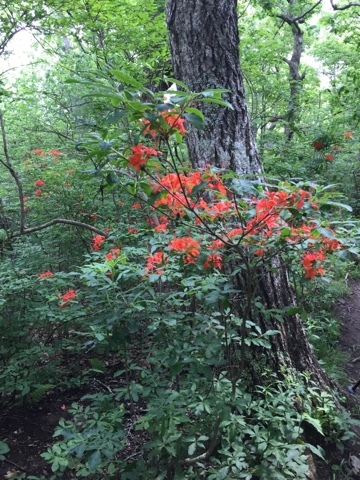 It was an incredible hike and we really enjoyed the beauty all along the path. 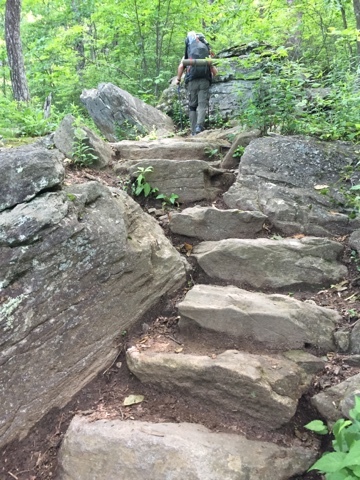 The rock steps were amazing to climb as well. 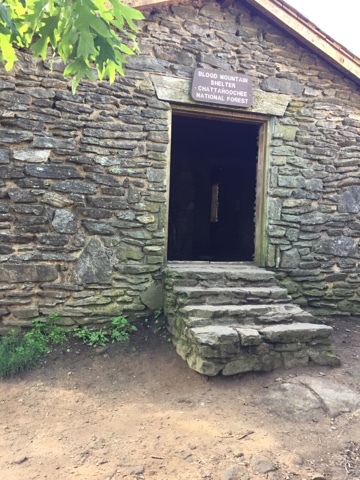 Just as you get to the top, you get a peak of Blood Mountain Shelter, one of the oldest shelters on the trail. 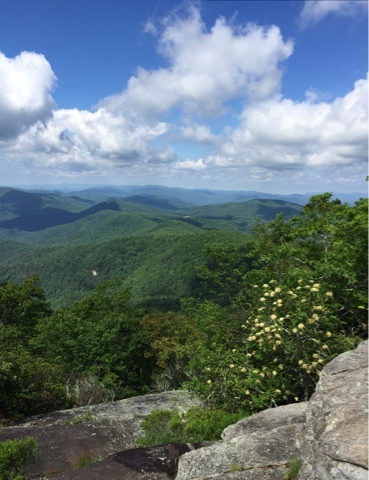 The most difficult part of the hike was the hike down Blood Mountain. It was very steep and rocky. If you follow me on Instagram, you know that I suffered damage to my nails on both of my big toes. One was so bad that a few days later, I had to drill a hole in the nail to relieve the pressure from the build-up of blood. Yeah, I know....GROSS! I guess you can say that Blood Mountain got blood from me 😏 I ended up losing my toenail too. But thankfully it appears to be growing back normally. 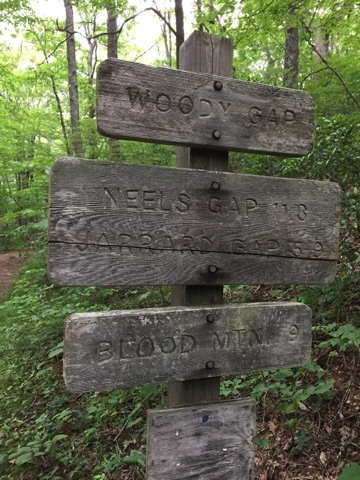 At the base of the other side of Blood Mountain is Neel Gap mountain crossing. If you're ever in the area, you must stop for a bit. They have a great little store for shopping and even carry an awesome selection of hiking gear in case hikers need anything. 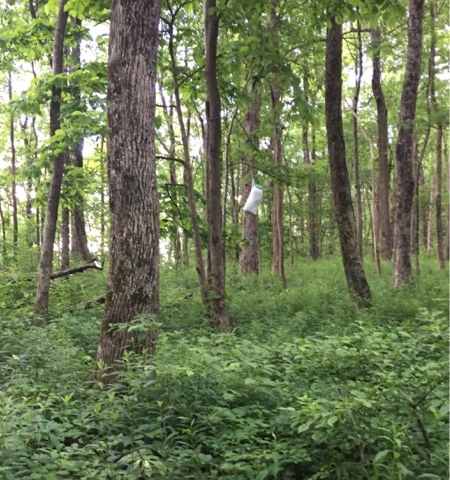 They also do shakedowns for hikers to help them lighten the load of their packs and even offer campsites and a hostel for hikers to stay overnight for a good rest. Since it was our anniversary, we treated ourselves to lunch there. It was nice to have a good 'ole sandwich for once and an ice cold Coke! 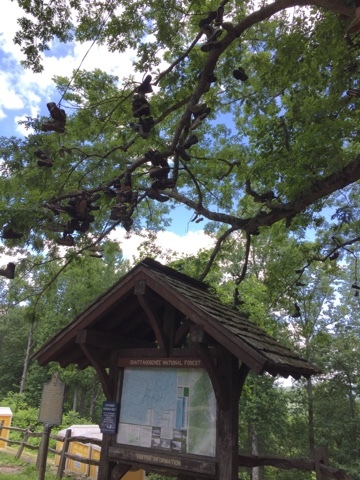 At Neel Gap, you will also see a tree where hikers can leave their hiking boots. 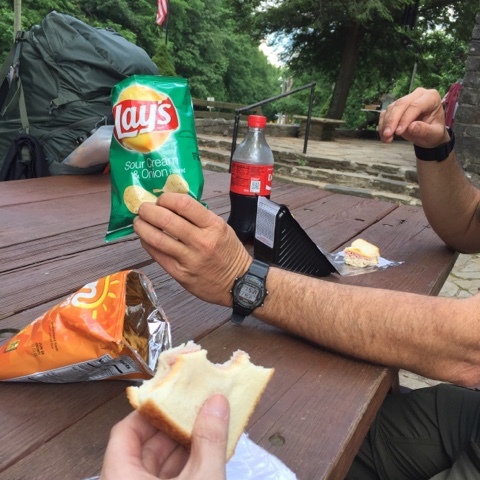 You are only able to do this if you've completed a certain number of miles of the AT. The Mister and I qualify, I believe, but our boots are not worn out just yet. 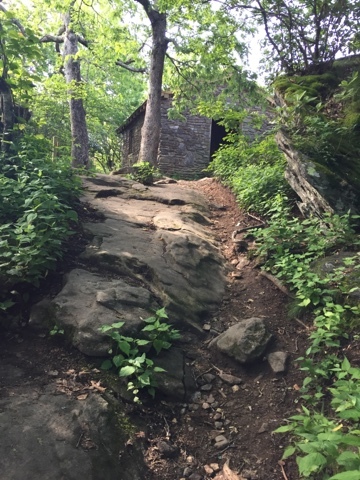 This is also the only section of the AT where you hike through a portion of a structure along the trail. 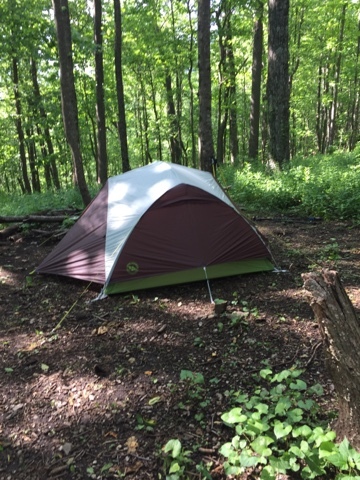 We thought we had a great tent on our first AT hike, but we purchased a Big Agnes tent from our favorite store, REI for this trip. It only weighs about 3 1/2 pounds. Scott carries the tent in his pack and I carry the poles and footprint. This was our first time sleeping in this one and we loved it! There's plenty of room for two and each side has its own door. You know how helpful that is when you need to get out and don't have to climb over the other person?! 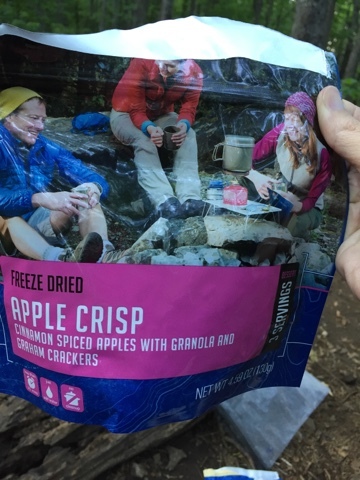 When we were at the store at Neel Gap, we purchased this Apple Crisp freeze dried dessert for a special treat after supper. Oh my goodness, y'all! It was delicious! We will definitely be purchasing more of these for our future hikes. So much beauty everywhere you look! 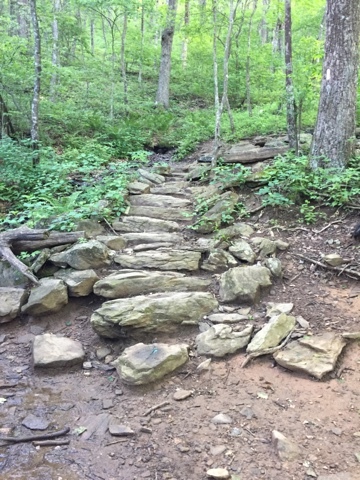 We were actually able to complete this section of the hike ahead of schedule. 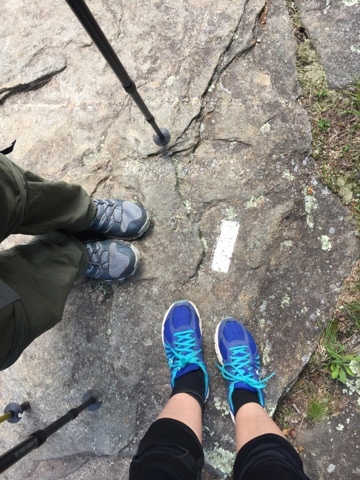 Instead of spending three nights on the trail, we only stayed two. 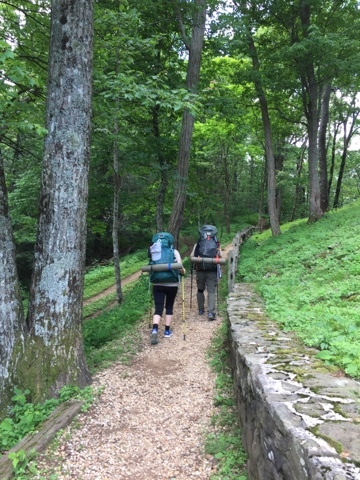 We reached Hog Pen Gap by lunch our third day hiking. I'm so thankful that the Mister enjoys these hikes as much as I do. 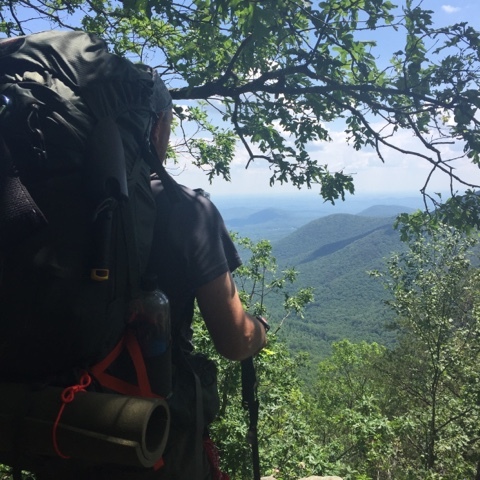 Section hiking the AT through Georgia and North Carolina is on my bucket list. I guess it's on his as well because he's fallen in love with it like me. We're already planning our fall trip and look forward to seeing the next section in all it's fall splendor! I'll be sure to share that trip with you all as well.